Bimblebox 153 Birds is part of a developing art project where writers, musicians and artists creatively engage with the avian residents of the endangered Bimblebox Nature Refuge to describe the bird species officially recorded there. Bimblebox Nature Refuge is 8000 hectares of native bush-land in Queensland, Australia, legally recognised as a Nature Refuge and part of the National Reserve System of Protected Areas. It is currently under threat from massive coal-mining projects both directly over and under the refuge plus all around it, throughout the Galilee Basin. Bimblebox Art Project is coordinated by artist Jill Sampson who developed the project as a way of exploring the material, visual, historical, scientific and physical existence of the Bimblebox Nature Refuge while questioning what the future holds and what human and societal value we place on it. 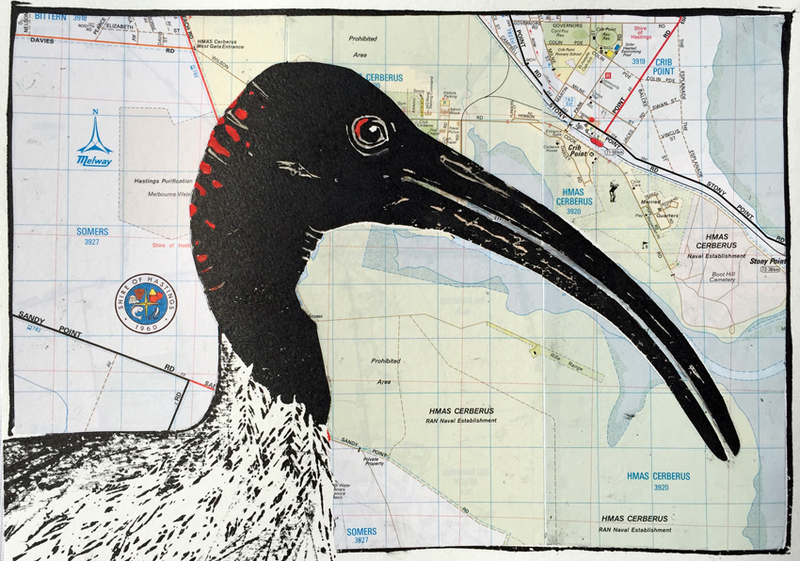 ARTIST STATEMENT: As human encroachments on wildlife refuges expand to provide resources for city dwellers & mining magnates, native wetland birds such as the Australian White Ibis move to cities to survive. Indeed this often-maligned bird, labeled a ‘tip turkey’ as it feeds on questionable waste, has become a city icon. Its apparently abundant numbers belie the health of wetlands on which it ultimately depends. Our Australian White Ibis is a close relative of the Sacred Ibis of Egypt, now in danger of extinction in spite of its once plentiful population. I’d like to elevate the Australian White Ibis from ‘tip turkey’ to sage, keeping in mind that the ancient Egyptian god Thoth, with the head of an Ibis, was considered a great counselor, mediator and patron of knowledge. This entry was posted in Uncategorized and tagged Australian birds, Australian White Ibis, Bimblebox 153 Birds, Bimblebox Nature Refuge, conservation, ecology, Galilee Basin, great artesian basin, linocut, mining nature reserve, printmaking, Threskiornis molucca. Bookmark the permalink.